Terry Teachout has dug out this wonderful Peter Brook conversation with Sir Thomas. “Although a musician with an international reputation, he was born and raised in St Helen’s”. Ha! Awful old-fashioned prejudice. I’m somewhat ambivalent about Beecham, who sounds like something of a bully to his players. But he got things done and had broad musical interests. He did, however, create rather too many orchestras, and we’re having to deal with that legacy to this day! Yes, but Beecham paid for them personally . Are there any conductors today who do that? 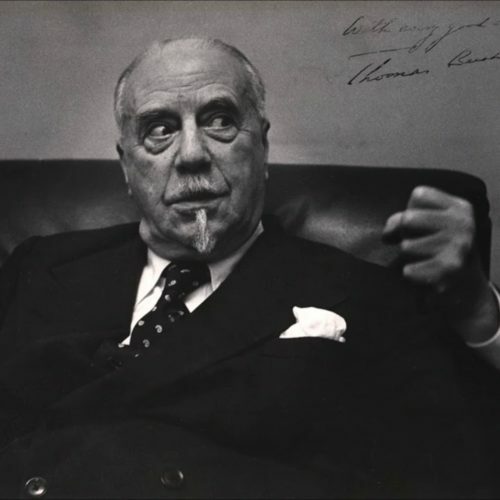 I played a concert a few years ago in an orchestra which was put together much like Beecham did it, conductor casting a net for the best players he could wrangle. It was great — except he didn’t possess Beecham’s fortune, and folded the group after one concert. I cheered him up by pointing out that if he divided the sum he was out of pocket by the number of hours he had spent on the project, the hourly cost wasn’t too unreasonable! During the rehearsals, one of the players commented to me that she was having a great time, the group was really fine, but she couldn’t understand how he was going to make it an ongoing proposition — so she was taking care to enjoy every minute! I have it on pretty good authority that the majority of musicians, singers, and choristers adored him, especially in his later life. Prigs in music? I assume he included himself in that? I loved Brooks’ nervous giggle after the ‘psychiatrist’ comment at c.15’20… his brother was one. I like his comments on rehearsal technique. Quite a bit of the rest comes off as Old Man Yelling at Clouds alternating with telling kids to get off his lawn. I rather think that Beecham bought his career. We don’t heah thet narratah’s accent any moah, do we? No, it has been replaced by estuary English (even by the queen). No time to watch the interview now, but I agree with the quote in the headline — or rather, if it’s true, then I’m glad to find out that other professions have fewer of them. I read the autobiography of Beecham decades ago; I cannot remember whether he could actually play a musical instrument. Not to any great standard. That did not prevent him becoming a remarkable conductor though. Whatever he was as a man, he left us some marvellous recordings. He also saved Furtwängler’s Jewish secretary from certain death by appointing her as his own secretary when she no longer could work in Germany. She left very interesting memoirs: B Geissmar, ‘The Baton and the Jackboot’. Not certain death. She had other options and plenty of time still to get out. But Beecham made it easy for her. “He doesn’t stop us every 5 bars, agitate us every 10 bars with some idiotic movement”. Beecham was a pompous old git. For a time in the 1940s, Beecham was music director of the Seattle Symphony.